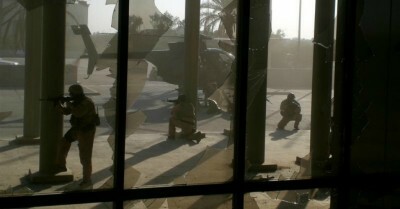 Following the sentencing of four private security guards convicted in the notorious 2007 massacre of innocent Iraqi civilians, attention has shifted to the growing role such private mercenaries are having on battlefields throughout the world. On Monday, three former employees of Blackwater Worldwide were given thirty-year prison sentences while one guard, Nicholas Slatten, who fired the first shot, was sentenced to life in prison for a shooting spree which resulted in the deaths of 14 Iraqi civilians in Nissour Square. The accused say they will appeal. Critics of the military industrial complex have long-warned about the difficulties of holding private security firms accountable for rights violations in foreign war zones. As Karska notes, these four Blackwater security guards are merely the tip of the iceberg for an industry that has expanded exponentially since the wars in Iraq and Afghanistan first broke out. On Tuesday, New York Times reporters James Risen and Matthew Rosenberg published a story highlighting what they say is the real legacy of Blackwater. While the State Department refused to divulge to the Times how many private security contractors they hire, in January, U.S. Central Command (Centcom) reported having 54,700 private guards under its jurisdiction. According to the Centcom report, 40,000 of those contractors are in Afghanistan alone, more than a third of which are American—giving new perspective to the U.S. footprint in that country when President Barack Obama says that less than 10,000 troops are deployed there. In response to the outcry after the Nissour Square shooting, Blackwater founder Erik Prince, who has been left virtually unscathed, renamed the company Xe Services before selling it in 2010. It now operates under the name Academi and has received more than $300 million in Pentagon funding for drug war efforts in Afghanistan. Blackwater–under a new name–still works for the US government. If corporations are people, they should have been given the death penalty.